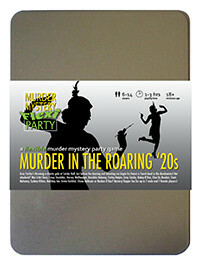 You've been invited to play the role of CLEA DU BOUDOIR in Murder in the Roaring '20s. Gray Catsby has invited his most talented and wealthy friends to a charity gala event at his countryside residence, Catsby Hall. But before any dancing and donations begin, Catsby’s fiancée, Ginger Whiskers, is found dead in the dumbwaiter! Join the flappers and dappers to find out who finished her off! You wear your maid’s uniform of a black dress covered in a white apron. Your hair is tucked up under a white cap and your lace-up boots are practical but smart. You carry a duster at all times. My name’s Clea du Boudoir and I’m Mr Catsby’s maid. My father was French and sometimes I slip into the accent, among other things. I’m not really used to mixing with glamorous, beautiful people like yourselves so I hope you’ll excuse me and my poor manners. I can’t believe what’s happened. Poor Mr Catsby! I didn’t know Miss Whiskers very well but she was always very kind to me.